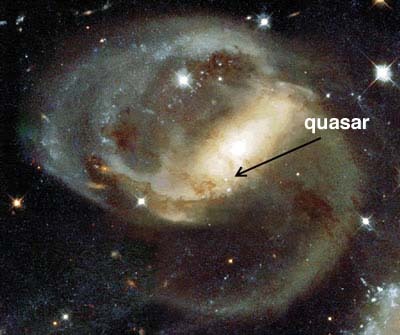 In 2005 a quasar with redshift z = 2.11 was discovered near the core of active galaxy NGC 7319 which is a low redshift galaxy (z = 0.0225) in Stephen’s Quintet that is located about 360 million light years away. As noted in a UC San Diego news release, this presents a problem for standard theory which customarily places a quasar with such a large redshift at a distance of about 10 billion light years, or 30 times further away. The finding that the NGC 7319 quasar is actually a member of a low redshift galaxy, indicates that the quasar’s redshift is neither due to cosmological expansion nor to tired-light redshifting, but to some other cause. This validates Halton Arp’s theory that most of the redshift seen in quasars has a noncosmological origin. There are two reasons to conclude that this quasar is associated with this particular galaxy. First, the dust in this part of the galaxy is so dense that it is unlikely that light from a distant quasar would be able to be visible through it. Second, a jet is seen to connect the active nucleus of NGC 7319 with this quasar suggesting that the quasar source was ejected from the core of NGC 7319. One likely cause of the quasar’s nonvelocity redshifting is gravitational redshifting of its emitted light. This mechanism rules out the possibility that the quasar is a black hole since to develop a redshift of 2.09 (2.11 – 0.02), the spectral lines would have had to be generated at a point that would lie within any hypothetical black hole event horizon. Black hole theory, however, forbids any such radiation from escaping the black hole. Consequently, we are left to conclude that the quasar is not a black hole but a “mother star” and that the observed redshifted emission consists of emission line photons that have redshifted as they have climbed out of the quasar’s deep gravity well. How we arrive at the above conclusion may be explained as follows. The gravity potential of a star varies as M/R, where M is stellar mass and R is stellar radius and redshift z varies in direct proportion to the change in the ambient gravity potential as the photon escapes the quasar’s gravity well. For the white dwarf Sirius B, z = 3 X 10-4 and its M/R = 4.2 X 1024 g/cm. This quasar has a redshift relative to that of NGC 7319 of z = 2.09, which is ~7000 larger than that of Sirius B. Consequently, if the quasar’s redshift is entirely gravitational, its line emission comes from a region whose gravity potential is 7000 times more negative than Sirius B, hence from a region outside the core where M/R = 2.9 X 1028 g/cm. If the quasar core, then, is assumed to have a mass of one million solar masses, this redshifted emission would have to originate at a radial distance of 2 X 1039/2.9 X 1028 = 6.8 X 105 km, or about one solar radius from the gravity well’s center. If, on the other hand, the quasar is assumed to have a mass of ten million solar masses, the redshifted emission would have to originate at a radial distance of 6.8 X 106 km, or about 9.8 solar radii from the well’s center. Now according to black hole theory, the Schwartzchild radius for a one million solar mass black hole would have a radius of 3.1 million km, equal to 4.5 solar radii. But, due to gravitational lensing, its Schwarzschild event horizon should appear to us to have a radius of 16 million km (5.2 times larger than the Schwarzschild radius). So, in this case, the quasar’s redshifted light would be coming from a radius almost 24 times smaller than its apparent Schwarzschild radius, an impossibility in black hole theory. We get a similar result if the quasar core is assumed to have a larger mass. For example, if it were to have a mass of ten million solar masses, its redshifted emission would have to originate at a radial distance of 6.8 X 106 km, or about 9.8 solar radii from the well’s center. A ten million solar mass black hole, on the other hand, would have a Schwartzchild radius of 31 million km or 45 solar radii, and taking gravitational lensing into account, would appear to have a radius of 234 solar radii. So, again, the redshift of this quasar indicates that the emission has come from a radius almost 24 times smaller than the event horizon radius. In the case where the quasar were instead a supermassive stellar core, a mother star radiating prodigious quantities of genic energy, it would have to have a radius equal to or less than the above estimated emission radius. If we assume for simplicity that the emission line radiation comes from the star’s surface, then in the case of a one million solar mass mother star, the star would have a density of 1.52 X 106 g/cm3. In the case of a ten million solar mass mother star, the star would have a density of 1.52 X 104 g/cm3. This is less than the density of a white dwarf such as Sirius B, which has a density of 4 X 106 g/cm3. The mother star would not be electron degenerate since a star having a mass in the range of one to ten million solar masses would only reach electron degeneracy when its radius had decreased to 20 to 40 km, or about 500 to 50,000 times smaller than the estimated radius. Such large radii are permissible since the mother star does not require electron degeneracy to support its mass; its immense outpouring of genic energy keeps it from contracting. For a discussion of electron degeneracy in celestial masses see the Astrophysics Spectator. The broadening of quasar emission lines, usually interpreted as being due to Doppler broadening of gas ejected from a quasar at high velocity, may also in part be due to the emission originating at differing depths in the quasar’s gravity well. For example, emission generated 10% further out from the center of the quasar’s gravity well would produce a redshift about ten percent lower, resembling an outflow velocity of ~5000 km/s. Another mechanism that could cause a nonDoppler redshift in quasar spectra is that suggested by Paul Marmet in which photons become redshifted as a result of scattering from clouds of electrons. He suggested this as a mechanism to explain the solar limb redshift effect as well as the redshift excess observed in quasar emission lines as compared with quasar absorption lines (Marmet, Physics Essays, 1988).